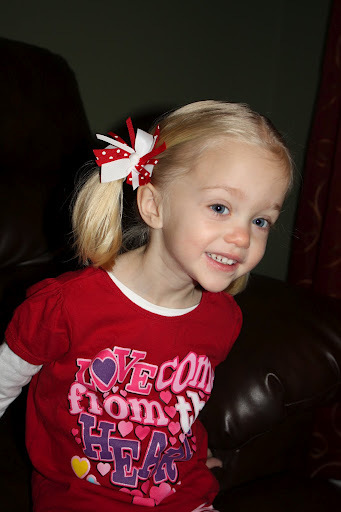 The week leading up to Valentine’s Day – Daphne’s Tot School theme was love and hearts. We read Guess How Much I Love You, You’re Lovable to Me, and Roses are Pink Your Feet Really Stink. Much of our activities came from Over the Big Moon. Working on one-to-one correspondance – putting one heart eraser into each heart cube. 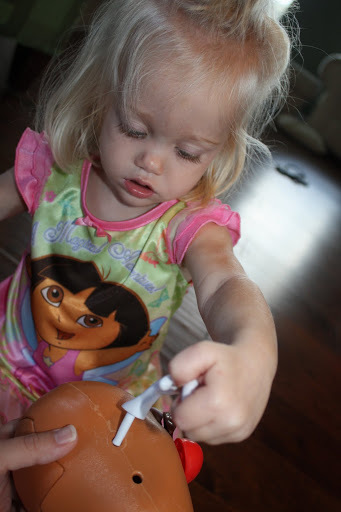 Daphne loves to do “which is different?” pages – I think she actually likes using the dry erase marker. 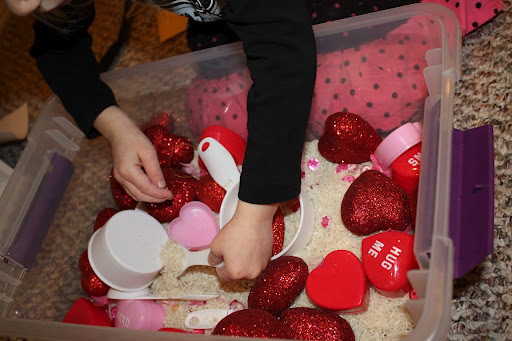 Valentine’s Day sensory box – rice was the base and then we filled it with Valentine’s goodies as well as some things for scooping. We ended our Valentine’s theme with a little Valentine’s party. The girls were excited to have some friends over for food, games, and goodies!! 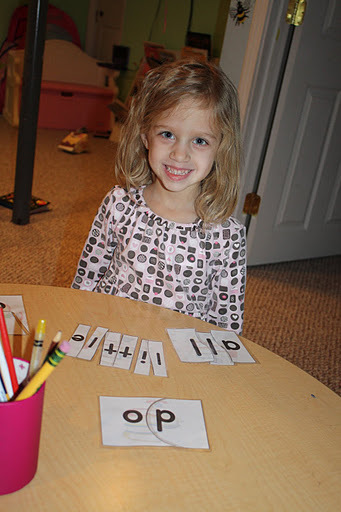 I want her to learn the first letter of her name so we spent last week on D!! I didn’t take very many pictures this week but here are a couple. Playing with her water tub and ducks! She loves this activity!! Painting with some feathers. 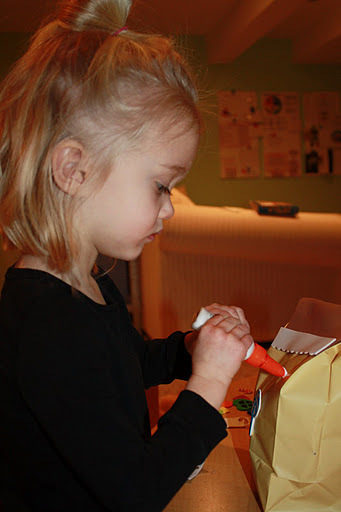 I wasn’t sure if she would be very interested in this activity, but she stuck with it for a long time!! 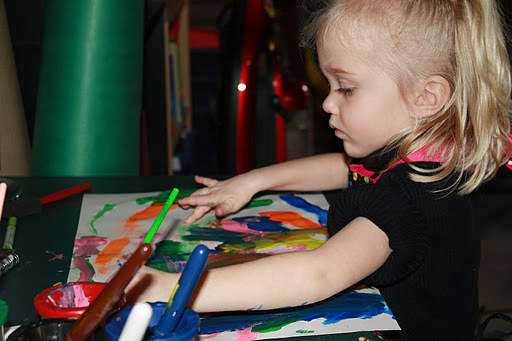 She spent most of her time swirling the colors together. We also read Make Way for Ducklings and Duck on a Bike (the girls LOVED this book – they thought it was hilarious!!) We sang “5 Little Ducks” and “6 Little Ducks That I Once Knew.” Daphne counted little duck beads and practiced 1-to-1 correspondence by putting one duck in each cube of an ice cube tray. She has been doing some pre-writing practice mainly because she wants to. If Lucy is writing – Daphne wants to write. I am using these books (she just uses book 1) plus a few printables from here (which is why we did some Dora stuff). We will probably spend another week on the /d/ sound after Valentine’s Day. I am planning on spend 2 weeks on each sound but using 2 different themes to teach it. That is about it for Daphne this week. I am sure I am missing something, though, because we were super busy all week! 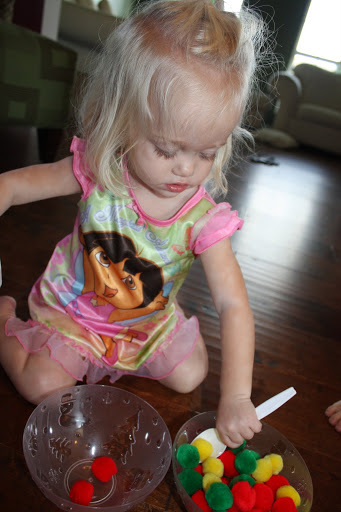 Go here for more Tot School ideas! Our intentional Tot School time has been few and far between. 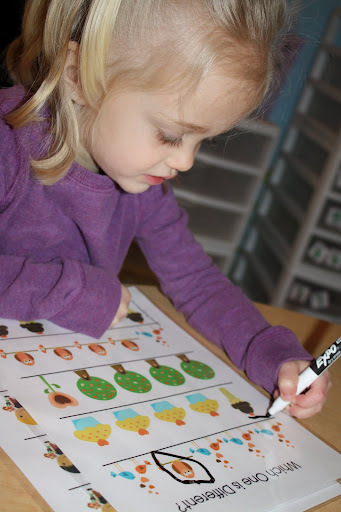 We play, read and color a lot, but I haven’t spent a lot of time preparing any specific activities for Tot School. This week has been different (so far). 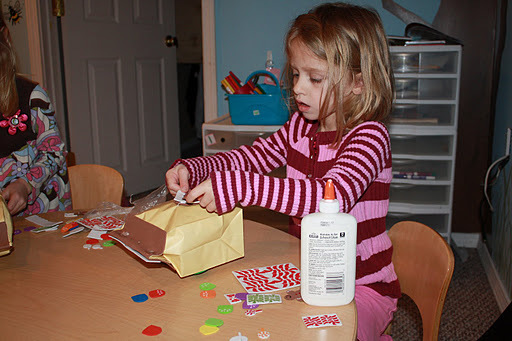 Daphne’s first collage – attaching red items to contact paper! She worked and worked on this!! Daphne is constantly trying to name colors but can’t identify any yet (totally normal, I know) so I thought doing a week of a specific color would give her an introduction to each color. Right now, almost everything is pink – imagine that! This week is RED! She still called everything pink – but I overemphasized that the objects were all red! Last week Daphne just did some really random things for Tot School. This is one of her favorite books right now. We also read this one alot. 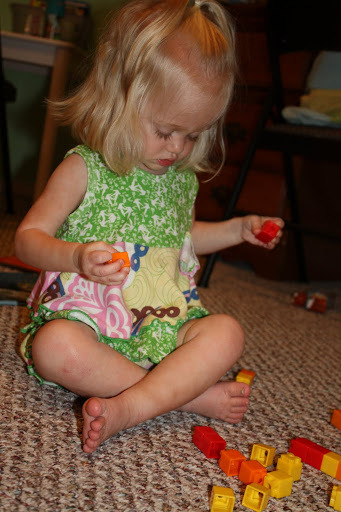 Daphne enjoyed using this Shape and Color Sorter. She took the shapes on and off and on and off. 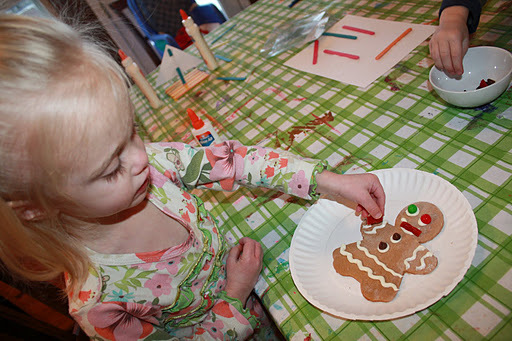 Lucy also joined in on the fun – but was a little stressed that Daphne was not actually sorting by shape or color. Daphne continues to LOVE coloring. 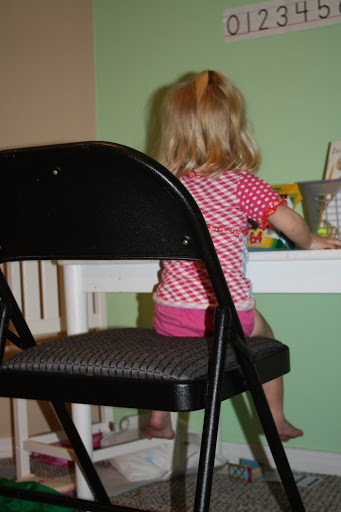 She is always so focused and she BEGS to color every day – especially if Norah or Lucy is writing/drawing/coloring. Lucy was working patterns for school last week and Daphne thought she needed to join in on the action. 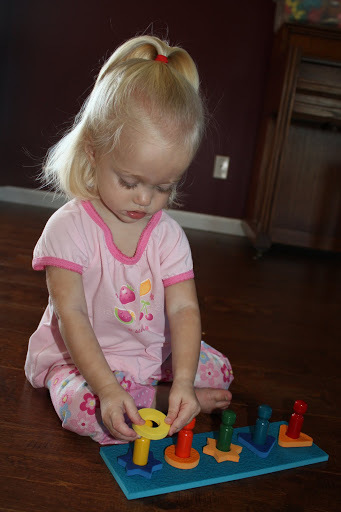 She worked really hard taking the unifix cubes apart and putting them back together. 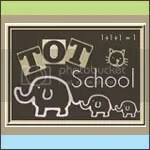 For more Tot School Ideas go to 1+1+1=1. 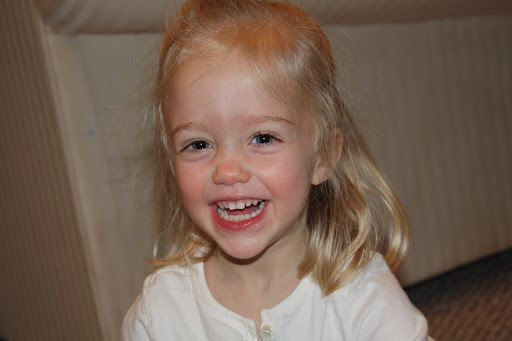 As a former preschool teacher, my mind tends to plan in themes so Daphne’s first theme is All About Me. We sang the songs Head, Shoulders, Knees and Toes and If You’re Happy and You Know It. We read The Foot Book and Hand, Hand, Fingers, Thumb. 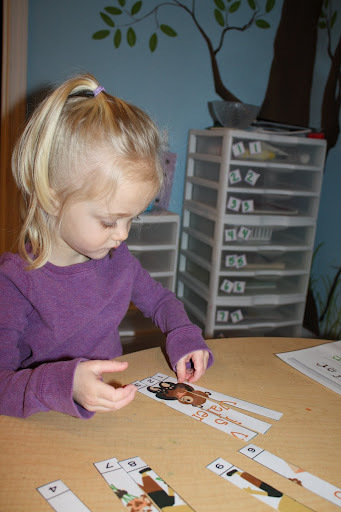 This week she played with the Linking People. She basically dumped them out and then put them in and out of the bowl. Daphne tried spooning the pom pom balls from one bowl to the next. She was really concentrating on this one. We played with Mr. Potato Head. Daphne could play with this forever! She takes the pieces out and puts them back in – over and over. 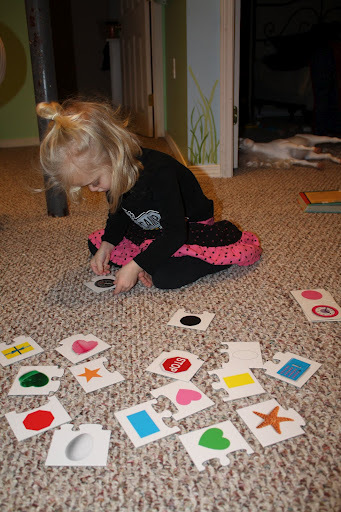 She is getting pretty good at identifying her body parts – so we practiced with Mr. Potato Head (ears, eyes, mouth, arms, nose). 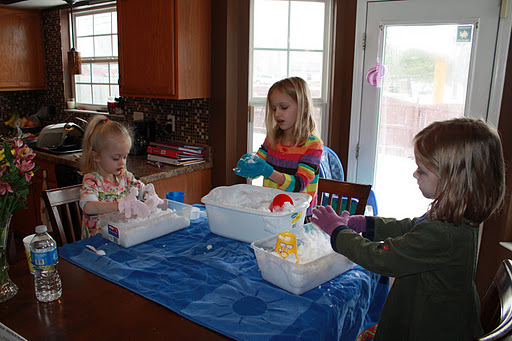 Check out more Tot School ideas at 1+1+1=1.